Up until recently I have spent most of my time in the pantser camp. A series of idea sparks and story scenes help me to begin a novel, and then, after those initial scenes are written, I work to bridge one part of the story to the next. It is a random, meandering, muse-dictated sort of storytelling journey. Despite my enjoyment of this method, I have always wanted to write chronologically. It seems like it would be much more efficient than tracing back over my steps time and again, to make all the plot lines and character arcs line up. Unfortunately, that just isn’t how my brain works. But with my newest story project, a sequel to my book Champion Chocolatier, time is of the essence. (Actually, it’s more than that… it’s time to make mortgage payment!) Now that I am working mostly for myself… I need to get this book done and out into the world! I MUST finish this book in time for Valentine’s Day. There is no time for pantsing. 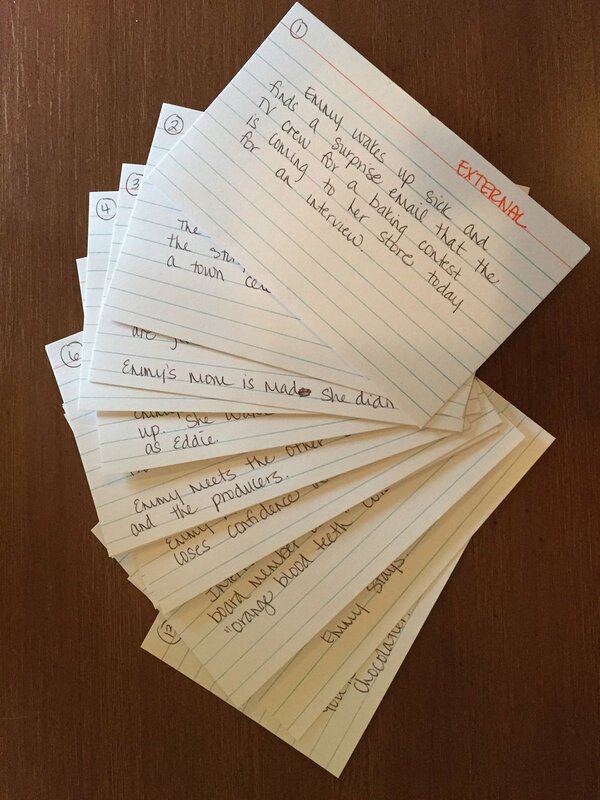 In a workshop for Great River Writes 2017, a series of writing events put on in my local community, Nick told us to take 20 note cards and write down one story scene per card. Just a sentence or two for each one. He then told us to arrange the cards chronologically and gave us the freedom to mix up the order, rearrange them or even add or delete scene cards. Once the story events were an order we felt good about, he told us to number them, and then, write a 5,000 word chapter per card. When all was said and done, we’d have a 100,000 word draft with which we could do something. That SOMETHING would probably be revising. But hey, getting the story out of your head and down on paper is the first step, and with this method, that task could be accomplished. Because of the self-imposed time crunch I am feeling for this new project, I decided to take Nick’s advice. First, I brainstormed several events that could potentially happen in this story. Then, I arranged them chronologically. Next, I took Deanne Gist’s advice in this video and made sure that I had a good amount of both internal and external conflict involved in my story. After my initial plot was created through this method, I typed up a few scenes I had started in my journal. (Old habits die hard! I didn’t want to waste the good things that had come to me prior to officially starting this project!) I then fit these scenes into the outline order, leaving placeholders and spaces for chapters I had not yet written. I also enhanced this work in progress document with some more planning charts. A competition is an integral part of this story. (Duh, sequel to Champion Chocolatier… there has to be some sort of contest!) As I embarked on this new way of storytelling, I needed to know the players of the game. I know Emmy Hudson (the main character in the first book) in great detail, but who are the other contestants and what are their backstories and candy making specialties? I also needed to know how many rounds of competition there were going to be and the challenges that would meet the contestants each step of the way. Finally, I thought it would be helpful to know who would win each challenge and who would be eliminated. Now it is time to write. I think now that all of this structuring has taken place… I can fly… not by the seat of my pants, but in a fingers-across-the-keyboard, sure-footed-plan-of-action kind of way. I currently have 6,000 words written of the first draft. My goal is to have around 40,000 words when all is said and done. Over the past few days I have been adding hand written scenes to my printed story scaffold. I’m excited to type them in later this week and see where I’m at with my word count. So far, I’m feeling like this method has been both productive and fun. It hasn’t taken away from my creativity the way I feared plotting might. It also has given me a great road map so that I can reach my destination (THE END) efficiently. Feel free to email me and check in. How many words are you at now Amanda? Are you on track to meet your December 31st goal deadline? Are you still following your charts and plot plan? Do you want to abandon ship and become a pantser again?